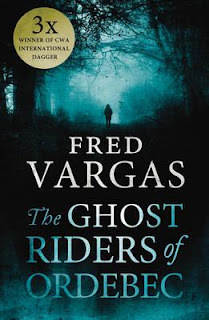 The Little House of Concrete Bookshelves: Fred Vargas "The Ghost Riders of Ordebec "
Here’s an exceptionally strong case for reading a series in order. While you could (I guess) read The Ghost Riders of Ordebec without having opened the previous episodes in a quite wonderful series there are two very strong arguments against that. The first lies in the fact that with Ghost Riders we’ve come to the point where there are no titles written in French in the translate these queue. That means we’ve probably got to wait for French medieval historian and archaeologist Frederique Audoin-Rouzeau to morph herself into Fred Vargas, spend three weeks turning out another Adamsberg title and a further six months on the editing process (source here) and then wait for translator Sian Reynolds to do her thing and render the title into English. Given that factor, those unfamiliar with the eccentricities of Commissaire Adamsberg and his misanthropic bunch of misfits would be best advised to go back to 2009’s The Chalk Circle Man (originally published in France eighteen years earlier) and working on through Seeking Whom He May Devour (1999/2004), Have Mercy on Us All (2001/2003), Wash This Blood Clean from My Hand (2004/2007), This Night’s Foul Work (2006/2008) and An Uncertain Place (2008/2011). Looking at that little sequence one can expect the next title, assuming one were to appear on the French best sellers’ list some time this year (two years since L'armée furieuse appeared in French, two years’ lead time to transform the furious army into Ghost Riders) to appear on our shelves some time around 2015, so you’ll have plenty of time to work your way through them. The other argument involves both the thoroughly quixotic Commissaire Adamsberg, and the team he’s built around him (you won’t find an outfit like this just coalescing) at the Serious Crimes Squad. His (mostly) loyal lieutenant Danglard, the depressive alcoholic walking encyclopaedia and single parent, Danglard's nemesis Veyrenc who delivers off the cuff remarks in rhyming couplets and the statuesque Violette Retancourt whose role this time around is largely confined to caring for a wounded pigeon aren’t the sort of characters you’re likely to come across anywhere else. A sequential reading helps make sense of the back story with those individuals being added to the fold gradually as the series evolves. The latest addition to the outfit, though he’s not an actual member of the squad is Adamsberg’s recently discovered twenty-eight-year-old son, Zerk emerged in An Uncertain Truth and one tends to suspect there’s someone on the periphery of The Ghost Riders who’ll end up being added to the cast at some point in the future. It’s that sort of series. When a fragile, panic-stricken little old lady named Valentine Vendermot travels to Paris from a village in the Calvados region of Normandy to tell Adamsberg (she’s quite definite who she wants to talk to) about the peculiar affliction that's befallen Ordebec she’s not quite sure she wants to enter the building that houses the Serious Crimes Squad. Seated in a nearby cafe, discussing his future with Veyrenc, who’s facing a reenlistment deadline after a brief investigation of a death involving suffocation through the agency of sliced bread, Adamsberg sees her loitering, knows who she’s there to see and ushers her inside. For any other protagonist this would come across as far fetched and unlikely in the extreme, with Adamsberg it’s pretty much par for the course. The old woman’s daughter Lina Vendermot has had a vision of the Furious Army, a ghostly horde of phantom riders from the Middle Ages lead by Lord Hellequin who allegedly search out people with serious crimes on their conscience. Those who appear in their clutches tend to disappear and later turn up gruesomely dead. This latest sighting had them carrying three victims Lina can identify and one she can’t. One of the three has already disappeared and the mother pleads with Adamsberg to help since three more lives are on the line and her daughter’s likely to be blamed for inciting the deaths. The man who has disappeared is a notoriously cruel hunter, and the local gendarmerie are inclined to dismiss the whole thing as silly superstition, which explains the old woman wanting to enlist Adamsberg’s services. Danglard, predictably, knows all about the furious army, This ancient cavalcade causing havoc in the countryside is damaged. The horses and their riders have no flesh. It's an army of the dead is his explanation, though he needs a minute to recall thirteenth century details he’s able to cite precisely. Again, in another setting, this would be remarkable. Here, it’s par for the course. Adamsberg has his own reasons for wanting to get involved. Apart from the morning’s strangulation a fabulously wealthy Parisian industrialist has been torched in his car in circumstances that point directly towards a known serial arsonist affectionately nicknamed MoMo and while he’s the obvious suspect Adamsberg believes he’s innocent and is willing to go to great lengths to prove it. This belief is based on traces of petrol on MoMo’s bootlaces, something that doesn’t add up because of the way MoMo would tie the laces. Again, remarkable elsewhere, routine for Adamsberg. MoMo, of course, having been taken into custody, needs to escape, something Adamsberg arranges through the unwitting agency of his narcoleptic offsider Mercadet, and having escaped needs somewhere to go to ground. Given the fact that the police will check MoMo’s known haunts, the best place to hide him is obviously chez Adamsberg, where he can be monitored by Zerk. So Adamsberg heads for Calvados, where he discovers the body of the man who’s gone missing and sets about attempting to ensure the safety of the others who’ve been sighted in the clutches of the horde, becoming embroiled in local politics as the prophecy seems to be being fulfilled. He strikes up a friendship with the elderly Léone, who knows the secrets that lie behind Ordebec's cast of oddball characters and when she becomes the victim of a decidedly non-spectral culprit, Adamsberg becomes determined to solve the mystery, aided and abetted by his own regular cast of oddballs. That’s the point where we draw the veil over proceedings, except to note the presence of long-running feuds, obscure aristocrats, unpleasant stepsons, secret marriages, six fingered hands, unplanned amputations, crossbows, speeding express trains, men made of clay, sugar lumps and Hebbeaud the injured pigeon that sleeps (and leaves deposits) in Adamsberg's shoe. Like everything else Vargas has done The Ghost Riders of Ordebec is original, eccentric, with a sly, understated sense of humour lurking below the crimes, dark fables and supernatural elements that turn out to have predictably human explanations, though the explanations themselves are rarely predictable. While it’s not the best place to start with Vargas' work and her inimitable character it’s a joy to read and left this particular reader trying to figure out how to fill in the lengthy lead time until the next instalment appears.